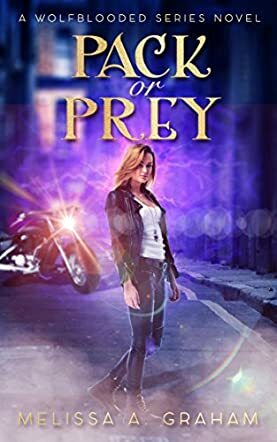 Pack or Prey: Wolfblooded Book 1 by Melissa Graham is a paranormal romance/urban fantasy novel about the life of a young girl who learns the price of spontaneity the hard way. This is a fast-paced, action-packed and very well-written story that had me sitting on the edge of my seat to find out what happened next. I have to admit, I was not a big fan of Harley at first and she frustrated me a lot, but her growth was great and she developed to become a stronger person who was ready to take charge of her life. Harley Rayne wasn’t living a happy life and she wasn’t really satisfied with how things were at home. She wanted attention and the love of someone in her life since her family wasn’t giving it to her. She always felt like the odd one in the family and there wasn’t much she could do about it. So when the handsome and enigmatic Frank rolled into her life on his bike with his bad boy charm, she fell hard. When the opportunity presented itself, she hopped on the back of his bike and ran away. It takes some time, but then she realizes that things are not as they seem with Frank. She is terrified and she is not sure what she should do. She can’t run away, but she can’t live with him as well. This was a pretty intense novel and I really wasn’t expecting that. I enjoyed the flow of the story and how the author grabbed the attention of the reader by keeping things fresh and snappy. I liked how complex Harley was; she was naïve in a sense, which is very fitting for her character. She developed beautifully and when she finally understood what was happening in her life, she took charge, which was refreshing. This is a pretty good read and the cover is very beautiful too. Entertaining and enjoyable!